The primary innovation of the K6S is its 6-cartridge cylinder capacity. Instead of being fluted, the exterior of the K6S cylinder is milled flat between chambers, except for the rear-most portion where the cylinder lock engages. At its widest point, the K6S cylinder is nine-hundredths of an inch larger in diameter than the cylinder of the various J-frame Smith & Wesson (S&W) .357 revolvers, and only one-hundredth of an inch larger than that of the iconic six-shot .38 Colt Detective Special. But at the cylinder’s narrow points, from one flat portion to another, the K6S is the same width as the J-frame Smith & Wesson, making the gun feel relatively small when carried inside the belt. It weighs only 23 ounces empty. 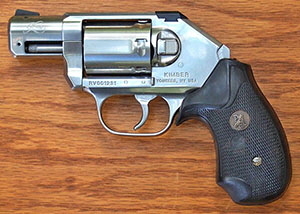 Kimber did not reinvent the wheelgun with the K6S. 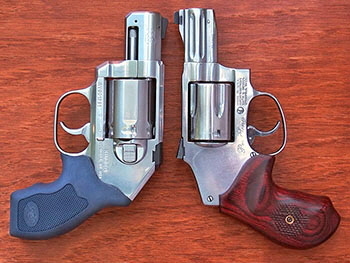 The lockwork is nearly identical with that of the Smith & Wesson small frame revolver design that has been in production with only minor changes since the early 20th century. 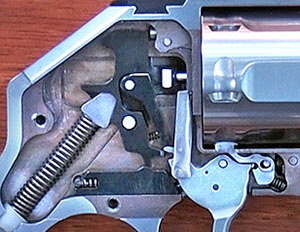 The K6S cylinder release mechanism is based on that of the Ruger double-action revolver. 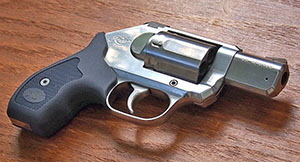 The K6S design is a direct evolution from the Smith & Wesson J-frame Centennial .38 Special of 1952, which in turn evolved from the Safety Hammerless of 1887, the “lemon -squeezer.” Eventually the Centennial was renamed the Model 40, and when it appeared in stainless steel it became the Model 640. 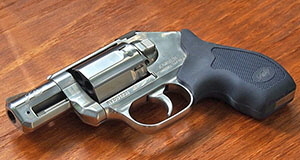 In 1995 the frame and cylinder were enlarged slightly to accommodate the .357 cartridge, and it became the Model 640-1. The K6S is a further refinement of the 640-1. The K6S features recessed cylinder chambers, a remarkably smooth trigger pull, and beveled contours all around, with nothing to snag on holsters or clothing. The front sight is pinned, while the low-profile rear sight is dovetailed and drift-adjustable. The compact grips are rubber and plastic with a very sticky feel to them--they are made by Crimson Trace, so it’s a no-brainer that laser grips will be available soon. Patrick Sweeney, in his Guns & Ammo article relates that Kimber actually redesigned the shape of the grip frame to reduce muzzle flip after tests with early prototypes revealed this problem. They were serious about putting out a product that would stand the test of time. There is no way to get around comparing the Kimber K6S to the Smith & Wesson 640-1. I own a Pro Series Model 640-1, so I will use it as my reference. Both the K6S and the 640-1 are about 6-5/8 inches long, about 4-1/2 inches high, and both weigh 23 ounces. The 640-1 has a 2-1/8 inch barrel, whereas I measure the K6S barrel at 1-15/16 inch (the Kimber website says 2 inches). Both guns come with concealed hammers, shrouded ejector rods, and similar grip plates and grip angles. The opening formed by the K6S trigger guard and frame is oval in shape, whereas that of the S&W is egg-shaped. 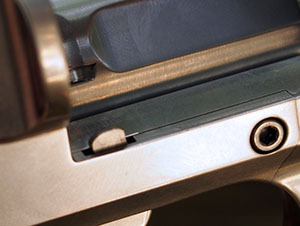 As stated above, the cylinder of the K6S is nearly a tenth of an inch larger in diameter than that of the S&W 640-1, but since much of the forward length of the cylinder has been machined flat between the chambers the difference is almost unnoticeable. Kimber has drilled the six chambers slightly closer to the center of the cylinder than normal, probably only by a few thousandths of an inch. I could not get my Safariland six-shot speed loaders to work with the K6S. A post on the Kimber forums states that the standard HKS speedloaders will work, but only if one uses a belt sander to flatten the areas between the holes to match the contour of the K6S cylinder. Kimber offers a special speed loader for the K6S on their website. I find it a bit awkward and the release turns in the opposite direction to that on the HKS, but I’m starting to get used to it. The cylinder lock on the Smith & Wesson 640-1 is just to the left of center at the bottom of the frame. 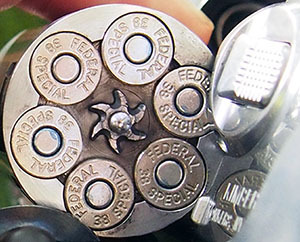 The locking slots in a revolver cylinder can only go between chambers, and on a five-shot revolver one of the spaces between chambers always lands above center at the bottom of the frame . But with a six-shot cylinder the opposing chamber falls in the middle of the frame and the spaces between chambers fall to either side of the frame, so the cylinder lock must be moved as far to the right as it can go in a small frame revolver--like on the Colt Detective Special--and in the case of the K6S the sideplate had to be inlet to allow for the cylinder lock to be positioned properly. The factory trigger pull on my Smith & Wesson 640-1 was a consistent 12 pounds, measured with my RCBS high-range trigger tension scale, and there were noticeable rough spots. I eventually performed a basic trigger job on it, smoothed out the rough spots, and got the trigger pull down to a consistent 10 pounds. The K6S came with a factory trigger pull of 10 pounds that is noticeably smooth. Patrick Sweeney reports (and provides a graph to support) that the K6S trigger does not “stack,” i.e., it does not require an increase in pressure on the trigger toward the end of the pull. It is very easy to “stage” the trigger on the K6S, which is to say pull it back until the cylinder rotates, hesitate briefly to steady your aim, and then squeeze the trigger the rest of the way through and ignite the cartridge. The K6S seems to stop very naturally at the perfect point, and the final squeeze of the trigger does not require additional pressure--it remains smooth and even to the end of the pull. Of course, many revolver experts recommend just squeezing through without hesitating because it is faster, but some of the best shooters in the world have used the staging method for greater accuracy. Your experience may vary. The extra $110 you pay for the Smith & Wesson 640-1 Pro Series over the standard 640-1 gets you tritium night sights, a fluted barrel, and a cylinder that accepts moon clips. I like the night sights, and I think the fluted barrel looks nice, but I have only found minimal advantage for the moon clip feature. I carry the gun loaded with five rounds in a moon clip, so they will all eject at the same time, but I find it impractical to carry extra moon clips because they are so easily bent. It is easier for me to carry a five-round Safariland speed loader. The Kimber K6S is being offered at a premium price over the S&W 640-1 Pro Series, and it doesn’t come with night sights, but the price difference is about the cost of the trigger job required to get as smooth an action on the Smith, and you also get an extra cartridge in the cylinder. You may wonder how Kimber gets such a good trigger. I can’t say for certain, but I can say that they changed the angle of the hammer spring on the K6S by about 6° from that of the S&W 640-1, and the K6S pushrod hits the hammer much closer to its pivot point than on the 640-1. The distance of the hammer throw on each gun appears to be about the same, but I was unable to measure it accurately. Maybe the change in geometry makes a difference. That aside, the internal parts of the K6S are simply better finished than those of the S&W. The hammer and rebound slide of the K6S seem to be coated with a black substance that is very smooth and slick. The interior of the K6S frame is very smoothly finished, so there is little friction. There was a time in the first half of the 20th century when the Smith & Wesson revolvers had a mirror-polish finish on both sides of the trigger, hammer, and rebound slide, but those days are long gone. Labor used to be cheap, but no more. If you want a mirror-polish finish on the parts in your S&W, you will have to put it there yourself or pay someone to do it for you. The K6S comes with a rectangular padded cloth gun pouch, clearly designed for an auto pistol, and a Desantis speed strip in the magazine holder. There is also a generic gun lock, a small sample of Shooter’s Choice FP-10 lubricant, and a manual which is largely irrelevant for an experienced shooter. The manual contains instructions for handling, loading, unloading, and cleaning, accompanied by a multitude of warnings and cautions so Kimber is less likely to be sued when someone does something stupid with their firearm. There is no parts list containing part numbers and no exploded view. I have been unable to find a parts list or parts diagram for the K6S on the Kimber website. The K6S comes with a limited one-year warranty for the initial purchaser. At the range I found the K6S quite unpleasant to shoot with 125 grain half-jacket hollow point .357 ammunition. To put it bluntly, it kicks like a mule and the recoil is painful. I think this is because the grips are too small for my hand and do not cover the backstrap which recoils painfully into my palm . I have medium-sized hands, not large, but my crooked index finger extends a quarter-inch beyond the trigger with the factory grips. I was able to keep most rounds on the paper plate target, but I could not get a really tight group with the K6S, especially with .357 ammunition. I managed one three-inch group with .38 Special. When I would get a small group going with the .357 ammo it would always be marred by a flyer. Staging the trigger did NOT help me to achieve better accuracy. Your experience may vary. I will point out, however, that Joel J. Hutchcroft reports some very fine shooting with a K6S revolver, including one group of five shots with Federal 158 grain Hydra-Shok cartridges that measured 1 .34 inches. Most of his other groups were in the 3 to 4 inch range, but all were at 25 yards, which is fine shooting from a short barrel gun. To be honest, the factory grip on the S&W 640-1 or the Ruger SP-101 does not fit my hands well either. One benefit of buying a Smith & Wesson is that there are hundreds of third-party grips available for almost any model. In general I do not think any of the small frame .357 pistols currently in production (S&W J-frame, Ruger SP-101, Charter Arms, etc.) can be described as pleasant to shoot, primarily due to undersized grips. They are all very light guns with heavy recoil . Elmer Keith was trying to get Doug Wesson to put larger grips on Smith & Wesson revolvers as far back as the 1930’s. A grip that fits the hand properly is the key to better shooting with any powerful handgun. I realize that the manufacturers have to offer a grip that will fit small hands, but it is shortsighted not to offer an optional larger grip with a small extension for the little finger. If the K6S sells well enough, maybe Pachmayr or Hogue will eventually produce oversized grips for it. Beyond that, a 3 inch barrel would be most welcome. The gun could benefit from a longer sight radius and would be more accurate. Two years later, Kimber now offers the K6S with a 3 inch barrel. I don’t have one yet, but I plan to buy one. The more I shoot the K6S the better I like it. The trigger is superb and the accuracy in fast and offhand shooting, rather than target shooing, is remarkable. Muzzle-flip is almost non -existent. On the negative side, the ejector is too short and does not cleanly eject spent shells (too short by a full centimeter, or 7/16 inch, for .357 ammunition). Kimber did not extend the ejector on the new model with the 3 inch barrel (a missed opportunity), so it has the same problem. Still, even with its faults, the K6S has become my favorite carry gun--lots of power in a small package, and very reliable. Cunningham, Grant, Grant’s SHOT Show 2016 Adventure, Part 1: the Kimber K6s revolver and new FourSevens flashlights. Grant Cunningham’s blog. Handgun Radio 122 - “The Kimber K6S Revolver with Grant Cunningham & Weerd Beard”. An interview with Grant Cunningham. Click the Download button to download the audio file of the interview. Hutchcroft, Joel J., “A Potent Pair” (Kimber K6S and Micro 9). Shooting Times, Dec. 2016/Jan 2017. Keith, Elmer, Sixguns. Stackpole: Harrisburg, PA: 1961. Nahas, Richard and Supica, Jim, Standard Catalog of Smith & Wesson, 3rd Edition. Gun Digest Books, Krause Publications, Iola, Wisconsin: 2006. Sweeney, Patrick, “The Sun Rises in the West: Introducing the Kimber K6s in .357 Magnum.” Guns & Ammo, May 2016. Copyright 2016-2018 by Ed Buffaloe. All rights reserved.